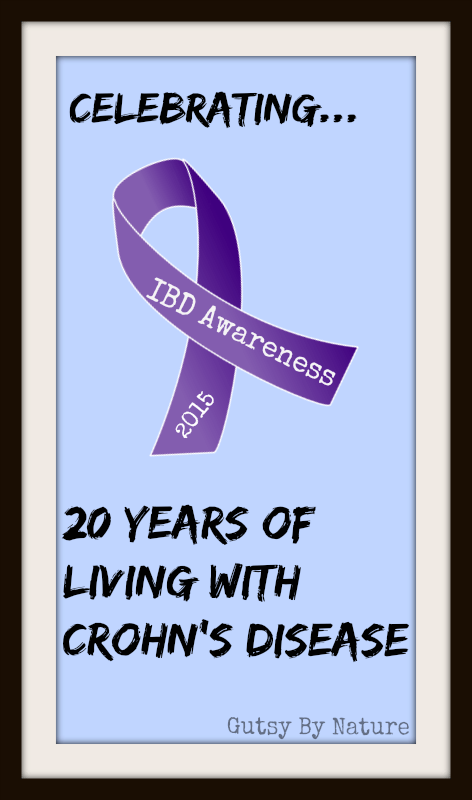 The first week in December is IBD Awareness Week and this year I am celebrating the fact that I have lived with Crohn’s disease for 20 years now. Yes, you read that correctly. I am CELEBRATING. Usually disease awareness campaigns are all about making people who don’t know anything about the illness aware of how terrible it is, about how much people who have it are suffering, about how badly we need a cure. But I’m going to leave that part of the campaign to others. Instead, I am focusing my awareness efforts on the people who already know all of that… other people who have been diagnosed with an inflammatory bowel disease. No one needs to tell us that this is a nasty disease. We know that from our own experience that IBD means more than just an “upset tummy” and frequent trips to the toilet. We know it can mean agonizing pain, hospitalizations, surgery, medications, and extra-intestinal complications like anemia, malnourishment, dehydration, joint pain, skin ulcerations, and more. Although our experiences may vary, we share the frustration that the medical community still hasn’t figured out these diseases and we want a cure, or at least more effective treatments. 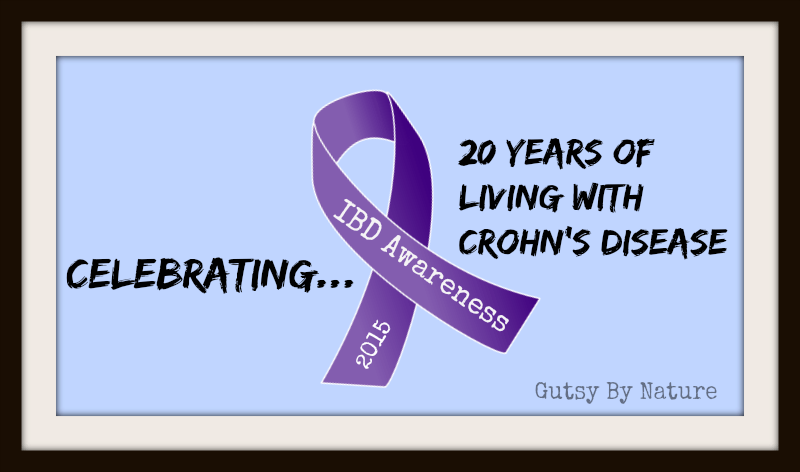 I was diagnosed with Crohn’s disease in summer of 1995, just before I turned 20. I had been having symptoms that were more annoying than debilitating for about a year, and was relieved to have a name and explanation for the embarrassing problems I was having. My doctor prescribed sulfasalazine and metronidazole, which helped enough that I didn’t need anything stronger until a couple years later when I was in my early 20s and had started my first full time job teaching high school English. At that point I did my first round of prednisone and started immunosuppressants and moved to Remicade (infliximab) shortly after it was approved in the late 1990s. That seemed to work well, though I didn’t realize that I was slowly developing scar tissue in both my sigmoid colon and ileocecal valve and in 2006 was told that I needed to seriously consider surgery soon to deal with the strictures that had developed and threatened to become intestinal blockages that would need emergency surgery. I elected to have that surgery in 2007, but I had life threatening complications that led to additional surgeries, which I have written about previously. The primary emotion I remember from the first decade of my life with Crohn’s was feeling completely alone. I didn’t know anyone else in real life with my diagnosis and the virtual support networks that exist today were in their infancy or didn’t exist at all. The only stories I did find on the internet seemed to be worst case scenarios and were far more scary than helpful. Thankfully, the world is different now! Blogs and social media allow us to share our stories and find information about the many different ways we can manage IBD, including through diet and lifestyle – either in lieu of or in tandem with conventional medications. The best part is that people are sharing their healing stories, proving that an IBD diagnosis doesn’t preclude living a full and happy life, which I wish I had had when I was newly diagnosed. If you or someone you love has been diagnosed with an IBD, I highly recommend following these blogs. They don’t all share the same approach to managing IBD (some are “paleo” bloggers, others are not) but they all share one thing – a positive attitude and an inspiring story! Know others? Please let me know in the comments!